So I gave it a try with three great painters: Giulio Romano, Paul Klee and George Caleb Bingham. 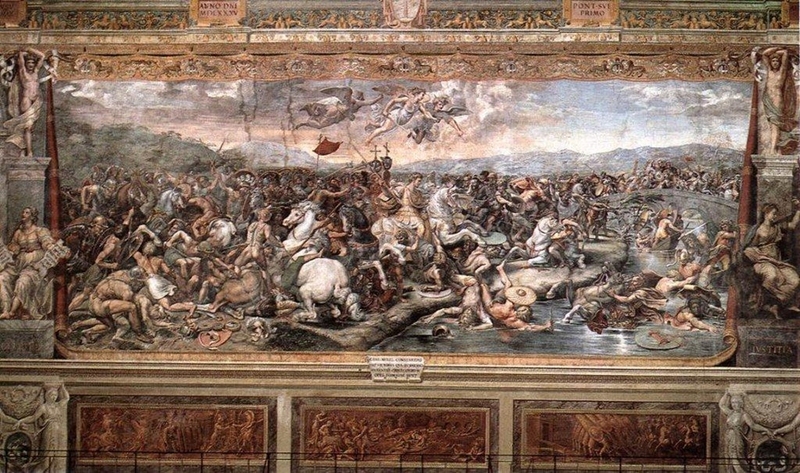 I like this beautiful fresco in one of the rooms that are now known as the Stanze di Raffaello, in the Apostolic Palace in the Vatican in Rome. It represents in clear terms a lot of an idea that is still so prevalent in today’s organizations: the archetypes of the knight on a horse or the Lone Ranger that fights the bad guys, charging into the future to deliver the promise of unending happiness. Indeed Constantine’s victory gave him total control of the Western Roman Empire paving the way for Christianity to become the dominant religion for the Roman Empire and ultimately for Europe. In the “The Conqueror” by Paul Klee, a painting of evident parodist intent, the leader is alone, running with a weird, almost solid banner to incite and guide others in the fight. Klee, who was himself a soldier for many years, seems to decompose the image of the traditional leader through lines, circles and other shapes. “The Conqueror” overall carries the strong message of the end of an era, where conquering and leading men in battle, motivating and influencing people to do or to perform, has lost much of its appeal as leadership work. 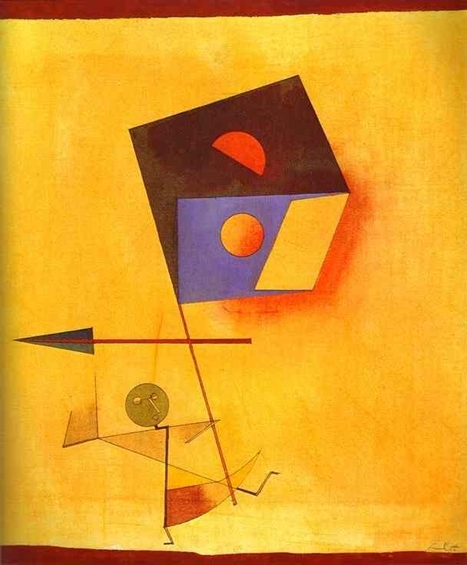 With Klee, an expressionist and surrealist with a knack for the use of abstractions, we are shown the inadequacy of our idea of leadership work based on the old paradigm and are invited into a space, a blank space – like the one in the canvas – where a new leader-follower relationship might emerge. This work pictures collective intelligence in action, the American democratic system in progress. The story takes place in a small Midwestern town in the mid-nineteenth century, when the rituals of voting were still taking shape, particularly in the frontier. 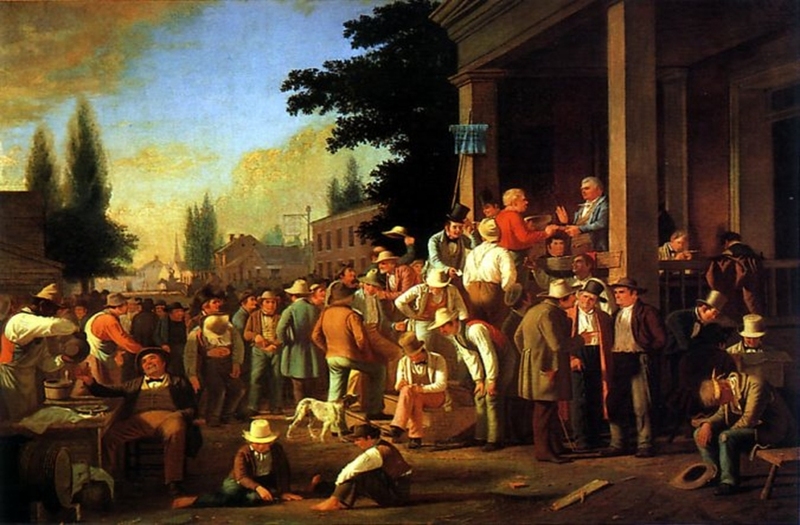 George Caleb Bingham – known as “the Missouri artist” for the state where he lived and worked – recognized the responsibilities as well as the rights of citizenship. In “The County Election,” he presents a raucous voting party as an enactment of democracy, bringing together a variety of residents in a rural community to make decisions for the common good. I like this image because it pictures the new paradigm of collaborative leadership, of people engaging together in the messy work ahead in order to make progress on the difficult issues of the day. I also like it because it reminds us how leaders “from every seat” can take responsibility for action rather than waiting for the “designated authorities” to act.